However, ​when returning home, ​Customs and Border Patrol ​ (CBP)​ disregarded the authorization granted by the other agency, ​questioning her eligibility for DACA and ​citing past issues with CBP​. ​ Yesterday morning CBP deported Lesly who opted to bring her two youngest children, including the infant she is still breastfeeding, with her. The case spread quickly over social media and the #Not1More campaign collected over 2,300 signatures in less than 12 hours as Border Patrol refused her access to legal counsel and ICE refused to review the emergency stay of removal filed by Lesly’s lawyer, Mony Ruiz-Velasco. On Thursday, February 4, at 11:45am Eastern time, Lesly will speak out on a press call with her lawyer and advocates working on her case to discuss its details, seek a reversal of her removal, and ensure that advance parole will be honored by all agencies within DHS when granted. For more information, call 712.432.0075. WASHINGTON, DC – U.S. Senators Mark Kirk (R-Ill.) and Kirsten Gillibrand (D-N.Y.) today introduced S. 2486, the Electronic Warfare Enhancement Act, which will enable the Department of Defense (DoD) to cut through acquisition red tape and provide more funding flexibility to develop electronic warfare technology. The U.S. military’s electronic warfare capabilities have fallen behind those of countries like Russia, China and Iran, leaving our servicemen and women vulnerable. This bill will get lifesaving electronic warfare technologies to the warfighter more quickly. Our country’s current acquisition process can take up to ten years, and often the technology being fielded is out-of-date by the time it’s approved by DoD. By including electronic warfare programs under the Rapid Acquisition Authority Program (RAA), S. 2486 allows program managers to waive acquisition rules and regulations to move more quickly in acquiring and fielding electronic warfare technology. Provides DoD with more funding flexibility for electronic warfare programs. The bill allows any appropriated funds for electronic warfare to be used for development and fielding of electronic warfare capabilities. Accelerates the acquisition process for electronic warfare technology. Electronic warfare programs included under the Rapid Acquisition Authority Program (RAA), allowing managers to waive acquisition rules and regulations to more quickly field technology. Currently the acquisition cycle is too long. DoD needs to be able to field a program within two years for it to be relevant. Requires strategic plan for enhancing U.S. military’s electronic warfare capabilities.The bill directs the Electronic Warfare Executive Committee to provide a strategic plan with measureable and timely objectives to Congress. The report is to include how services plan to jointly work together on EW; streamlining acquisition and budget process; improvements in training with EW technology; capability gaps; and advancement in offensive capabilities. “Senate President Cullerton has shown strong leadership on the issue of fair and equitable education funding, which is so important to every community across our state. The President’s commitment to fairly funding our schools and helping all students meet their full potential is one that I share, and I plan to work with him to achieve this goal while making sure that voices from across our state are heard and that all schools and programs are protected throughout this process. The Education Funding Task Force will convene Tuesday, Feb. 16 at 10:30 a.m. in Room 114 of the State Capitol. 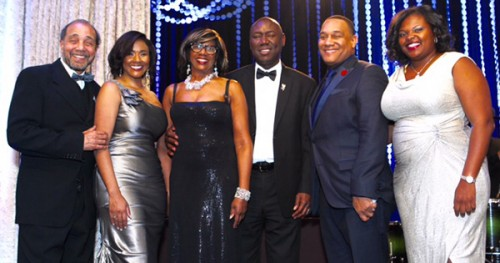 Los Angeles, CA (BlackNews.com) – The almost century old John M. Langston Bar Association, Californias oldest and largest African American bar association, hosted their 40th Annual Scholarship and Awards Gala on Saturday at the Beverly Hills Hilton Hotel. Among the sold-out gala guests were Los Angeles City Attorney, Mike Feuer, Los Angeles City Councilman, Curren D. Price, and renowned Civil Rights Attorney and National Bar Association President, Benjamin Crump. KTLA 5 Morning News Co-Anchor, Chris Schauble, served as Master of Ceremonies and Langstons community partner, A Place Called Home, entertained guests with an all-youth band. The nights theme of “Continue the Legacy and Advance the Vision” was emphasized by newly installed Langston Bar President, Kimberly Willis, when she addressed the audience. Langstons founders understood the critical importance of service to the community and diversity in the bar and on the bench, said Willis. There is a correlation to the disproportionate number of African Americans entangled in the American legal system and the low number of African American lawyers and judges Black lawyers matter. Lawyer of the Year honoree, Paulette Brown, who is President of The American Bar Association and the first African American woman to hold the position, underscored the legal professions need for diversity; reminding the audience that 88% of Americas lawyers are white and only 4.8% are black. This years Advocate for Justice honoree, AREVA D. MARTIN, who is President of Special Needs Network and Managing Partner of Martin & Martin LLP, shared a moving story of her personal intervention in the life of a homeless woman. You don’t have to be an attorney to advocate for justice. urged Areva. Any of us have the capacity to stand up for others. DENNIS S. ELLIS, Partner at Paul Hastings and son of Judge Sharon Majors-Lewis, received the Legacy of Leadership Award and inspired guests with his testimony about maintaining his confidence when facing seemingly insurmountable odds. The Corporate Service Award was bestowed upon JOHN E. PAGE, Senior Corporate Vice President, Chief Corporate Social Responsibility Officer & Chief Legal Officer of Golden State Foods. Page surprised attendees with a personal commitment of an unprecedented five years in scholarship funds to Langston. Former City Attorney and current President & CEO of Southern Californias Junior Achievement, BRIAN K. WILLIAMS, received the Community Service Award. Williams implored guests to volunteer with Junior Achievement and like organizations and to mentor young people in our community. The Langston Gala serves as the primary fundraiser for the organization. Recent honorees include Los Angeles District Attorney Jackie Lacey, basketball legend and co-owner of the Los Angeles Dodgers, Earvin Magic Johnson and actor Blair Underwood. The Langston Bar Association is a federally recognized 501(c)3 public-interest, nonprofit organization. Each year Langston hosts numerous community outreach programs and activities, including law school scholarships, bar examination tutorials, election poll monitoring, junior and senior high school education programs, mentoring for law students and young attorneys, continuing legal education, job fairs, judicial officer candidate evaluation, and pro bono legal clinics. WASHINGTON, DC – The former director of switchboard operations at the White House pled guilty today to a charge of theft of government property for a scheme in which she stole over $5,000 through altered time and attendance records, announced U.S. Attorney Channing D. Phillips and Paul M. Abbate, Assistant Director in Charge of the FBI’s Washington Field Office. Andrea Turk, 46, of Upper Marlboro, Md., pled guilty in the U.S. District Court for the District of Columbia. The Honorable Senior Judge Gladys Kessler scheduled sentencing for April 20, 2016. The charge, a felony, carries a statutory maximum of 10 years in prison and potential financial penalties. Under the advisory federal sentencing guidelines, Turk faces up to six months of incarceration and a fine of up to $20,000. She has agreed to pay restitution as well as a forfeiture money judgment of $5,015. Beginning at least as early as June 2, 2012, through July 27, 2013, Turk used her supervisory position to alter the time and attendance records of “Employee A” to reflect overtime hours that were not actually worked. In turn, “Employee A” paid Turk money generated through the scheme. Over that time-frame, “Employee A” was paid approximately $12,475 for 396 overtime hours, but only actually worked and legitimately earned less than approximately 50 of these hours. As a result, “Employee A” received approximately $10,900 in overtime pay from the United States government to which “Employee A” was not entitled. “Employee A” thereafter paid approximately $5,015 to Turk, mostly through a series of bank transfers. No other charges were filed in the investigation. In announcing the plea, U.S. Attorney Phillips and Assistant Director in Charge Abbate commended the work of those who investigated the case from the FBI’s Washington Field Office. They also acknowledged the efforts of those who worked on the case from the U.S. Attorney’s Office, including Paralegal Specialist Tasha Harris, Legal Assistant Angela Lawrence, and Assistant U.S. Attorney Diane Lucas, who assisted with forfeiture issues. Finally, they expressed appreciation for the work of Assistant U.S. Attorney David A. Last, who investigated and prosecuted the matter. Mountain View, CA (BlackNews.com – HBCUConnect.com, in partnership with Symantecs Black Employee Resource Group, is hosting a networking event for HBCU Alumni and other African American professionals in the San Francisco Bay Area. The event will give them the opportunity to meet with representatives from Symantec to learn more about career opportunities, network with their peers, as well as open up one on one discussions that could lead to future employment. HBCUConnect.com, a professional social media platform for students and alumni of Historically Black College and Universities (HBCUs), has facilitated similar events in the past on the east coast where African American professionals enjoyed networking and took advantage of career opportunities that resulted in many hires at some of the best companies in the country. This particular event, however, is especially for HBCU Alumni as well as African American professionals specifically living or working in the San Francisco Bay Area. Symantec is excited about the opportunity to host the event and network with talent in the area, introducing them to the amazing staff at Symantec and also some of the cool things about working there. This is an excellent opportunity for African Americans living or working on the West Coast to make new connections, expand their network, and explore new career opportunities. The event will be held on February 18th from 5pm to 7pm and will be RSVP only. Once attendance is confirmed, the exact location will be shared as well as details on parking and the agenda for the evening. Founded in 1999, HBCU Connect (www.HBCUConnect.com) is the first and largest media outlet targeted towards the Historically Black College and University (HBCU) community. Boasting over 1.5 million registered members and encompassing a complete web portal, magazine, recruiting engine, social networking site, forums, blogs, news feeds and shopping, HBCUConnect.com serves the needs of HBCU aspirants, students, alumni, faculty and staff by providing a single destination and launching point for the entire diaspora. Symantec, founded in 1982 by visionary computer scientists, has evolved to become one of the worlds largest software companies with more than 18,500 employees in more than 50 countries. They provide security, storage and systems management solutions to help their customers from consumers and small businesses to the largest global organizations secure and manage their information-driven world against more risks at more points, more completely and efficiently than any other company. Atlanta, GA (BlackNews.com) – Two top media sites for reaching millennial and multicultural audiences have partnered to offer expanded reach for brands trying to connect with these coveted consumers. Popular news site theGrio.com and lifestyle and entertainment outlet RollingOut.com have joined forces to form the Rolling Out Digital Ad Network. TheGrio, rolling out and the other digital sites in the network will reach more than 10 million targeted consumers through the websites and social media channels with geo-targeting capabilities. This alliance provides advertisers with a diversified digital platform representing some of the best in news, lifestyle and entertainment content. This content is offered through mobile, web, and video to audiences who over-index on consumption of digital content. Established in 2009, TheGrio has been a premier news organization for the urban community for delivering content to its online community. Rolling out has been the source for national and local lifestyle and entertainment news for more than 15 years, maintaining both print and digital publications. The minority-owned network will provide digital, mobile, and video scale for reaching African American audiences that companies want to authentically connect with. The alliance will also provide cultural insights and data, said Munson Steed, president and CEO, Steed Media Group and RollingOut Digital Ad Network. TheGrio is proud to join efforts with RollingOut. This partnership not only allows us to better serve our users with the quality content they have come to expect from our brands but also presents a one-stop shop for advertisers looking to reach Americas most influential demographic, the urban millennial, in an authentic and effective way, said David A. Wilson, theGrios co-founder and executive editor. TheGrio and RollingOut will produce exclusive investigative pieces and offer exclusive 2016 campaign coverage, community information, technology coverage, and highlight issues affecting the African American community. The networks sales team will represent both media properties as well as other targeted sites reaching young, urban professional content consumers who access these sites daily for news on fashion, politics, social justice, celebrities, art and more. Rolling out is also adding a new content studio to its offering to provide targeted and engaging content that can be supported through brand partnerships. Located in its Atlanta headquarters, the studio will begin production on serialized original video content and newscasts in partnership with TheGrio. Rolling out offers hyper-localization of original content given its print and online platforms with newspaper distribution in 19 cities across the country. Rolling out will continue to provide amplification opportunities for brands through the network including signature events and custom content. Steed Media Group is a multimedia company comprised of several media brands including RollingOut urban style weekly, RollingOut.com, video-on-demand (VOD) channel Hip Hop On Demand, Talking Pretty and several others. Headquartered in Atlanta, Georgia with several offices across the country in key African American media markets, Steed Media Group produces and distributes 19 newspapers, and develops content for custom magazines, television programming and production, internet properties, and branded publications such as Producer 10. Steed Media Group also creates signature events and marketing initiatives. The independently owned, theGrio.com is a video-centric online news community devoted to providing African-Americans with stories and perspectives that appeal to them but are underrepresented in existing national news outlets. Based in New York city and reaching 6 million people every month, theGrio.com serves stories that affect and reflect urban America through original video, opinions, and cover everything from breaking news to politics, health, business and entertainment. Rev. Dr. Howard-John Wesley, the pastor of the historic Alfred Street Baptist Church in Alexandria, Virginia will receive the prestigious 2016 NAACP Chairmans Image Award on Friday, February 5 in Los Angeles during the LIVE broadcast of the IMAGE AWARDS, airing on TV One at 9pm, EST/8pm CST. Alexandria, VA (BlackNews.com) – Alfred Street Baptist Church, one of the oldest, largest and most prominent African American congregations in Alexandria, Virginia is proud to announce that Rev. Dr. Howard-John Wesley, a biblical scholar and orator, will receive the 2016 NAACP Chairmans Image Award. Dr. Wesley is a much sought after preacher and featured keynote speaker for various churches and leadership programs and the dynamic pastor of the historic Alfred Street Baptist Church in Alexandria, Virginia, whose history dates back more than 200 years. Under the helm of this powerful visionary, teacher and social justice leader, Alfred Street Baptist Church is the first and only faith-based organization to date to donate $1 million to the Smithsonian’s National Museum of African American History and Culture (NMAAHC). Not afraid to tackle social and political issues, Dr. Wesley has led community protest marches against the New York grand jurys decision not to indict in the death of Eric Gardner. His sermon, When the Verdict Hurts, was acknowledged in Time magazines July 29, 2013 cover story, After Trayvon as one of the best sermons preached in the United States following the not guilty verdict in State of Florida v. George Zimmerman. Three of Dr. Wesleys sermons, When the Verdict Hurts, A Rizpah Response, (along with the black hoodie he donned while preaching this sermon), and Tell Your Own Story, will all be archived in the NMAAHCs faith-based collection. I am so very humbled and grateful for this honor and recognition; however, I know that this award is a true testament to all of the members, volunteers, staff and leadership who work hard every day to achieve excellence at Alfred Street Baptist Church. This recognition by the NAACPs Chairman of the National Board of Directors allows me the opportunity to highlight all of the social justice initiatives and community outreach that we are doing at Alfred Street Baptist Church. I’m extremely proud to lead a congregation that is so blessed to be in a position to make an impact on the lives of others as well as to be an agent of change, said Rev. Dr. Howard-John Wesley. The Chairman of the NAACP National Board of Directors, Roslyn M. Brock, will present the prestigious Chairmans Award to individuals and organizations who have used their distinct platforms to be agents of change. The other recipients are Brittany Bree Newsome; Justice League NYC; Concerned Student 1950 Collective at the University of Missouri, Columbia; The University of Mississippi NAACP College Chapter; Rev. Dr. Otis Moss III; Rev. Dr. Howard-John Wesley; Rev. Dr. Jamal Harrison Bryant, and Jussie Smollett. The presentation will take place during the 47th NAACP Image Awards, broadcast live on Friday, February 5 (9:00 p.m. ET/PT tape-delayed) on TV One, the civil rights organization announced today. The NAACP Image Awards celebrates the accomplishment of people of color in the fields of television, music, literature and film and also honors individuals or groups who promote social justice through creative endeavors. The multi-cultural show is one of the most respected events of its kind and is well attended by many of the top names in the entertainment industry. Winners will be voted upon by NAACP members and announced when the envelopes are opened on Thursday, February 4 during the Awards Ceremony for non-televised categories. The remaining categories will be announced LIVE on stage during the two-hour star-studded TV One telecast on Friday, February 5 (9:00 p.m. ET/PT tape-delayed). The telecast will also include a one-hour pre-show airing LIVE from the red carpet (8:00 p.m. ET/PT tape-delayed). The 47th NAACP Image Awards is sponsored by AMC, AT&T, Bank of America, Comcast, Chrysler/UAW, FedEx, Ford Motor Company, Hyundai Motors America, The Walt Disney Company, and Wells Fargo. For all information and latest news, please visit the official NAACP Image Awards website at www.naacpimageawards.net. Founded in 1909, the National Association for the Advancement of Colored People (NAACP) is the nations oldest and largest nonpartisan civil rights organization. The NAACPs 250,000 adult and youth members throughout the United States and the world are the premier advocates for civil rights in their communities and monitor equal opportunity in the public and private sectors. In the fall of 2011, the NAACP launched a process to develop its strategic direction and plan, creating a powerful vision for the future, and setting organizational goals that would focus its work for the 21st Century. The six NAACP Game Changers (Economic Sustainability, Education, Health, Public Safety and Criminal Justice, Voting Rights and Political Representation, and expanding Youth Engagement) are the major areas of inequality facing African-Americans that are the focus of the NAACPs work. Launched in January 2004, TV One (www.tvone.tv) serves 57 million households, offering a broad range of real-life and entertainment-focused original programming, classic series, movies and music designed to entertain and inform a diverse audience of adult Black viewers. The network is the exclusive home of News One Now. Silly, Yes, But You Smiled! Hilarious & Nonsensical New Book Turns History, Politics & Celebrities Inside Out and Upside Down…! Posted by Admin On February - 4 - 2016 Comments Off on Silly, Yes, But You Smiled! Hilarious & Nonsensical New Book Turns History, Politics & Celebrities Inside Out and Upside Down…! Masterfully crafted by Poppa Talbert, ‘Silly, yes, but you smiled!’ is a far-fetched, plain-rowdy yet always-hilarious new book that will provide uplifting bursts of entertainment when sitting on the toilet or waiting at the bus stop. Turning the world, its cultures and its people upside down, Talbert cuts through seriousness to provide readers with snappy one-liners designed to bring a smile to their face. Having spent decades working in the radio industry, Talbert was famous for his ability to make audiences laugh (and cringe) with his unique brand of humor, now being compiled into a single volume. Oh yes, by the way – did you know that chicken is the most frequently shoplifted pot pie?! Franklin, NH – There’s no way to sugarcoat it; we live in a society too darn focused on the serious and the mundane. In fact, some social commentators have gone as far as to say that the modern busy human has lost their sense of humor altogether. Take a deep breath and prepare to welcome Poppa Talbert into your life – a man who lives for the nonsensical, the quirky and the plan absurd. But it’s all for good reason, Talbert’s strange brand of humor produces endless one-liners that span politics, history, celebrities and just about everything in between. From phrases such as “Just like his dogs, President Nixon used to romp and play on the White House lawn and occasionally take a dump” to “Nobody named Biff or Spike has ever won the Nobel Peace Prize”, Talbert knows how to rekindle that simple pleasure of putting a smile on someone’s face. In ‘Silly, yes, but you smiled’, hundreds of one-liners come together to form an encyclopedia of the lighter side of life. The world turned upside down and inside out with no regard to the sanctity of history, people, places and things! Life should be this ridiculous so we can all just scratch our heads and smile! With the volume’s demand expected to increase, interested readers are urged to secure their copies as soon as possible. ‘Silly, yes, but you smiled’, from FriesenPress, is available now: http://amzn.to/1mOOkPZ. Born in Houston and raised in IL, NJ, NY, IN, CT and OK. Now reside in NH with wife Donna. Sanders has opposed the Pacific trade deal, the North American Free Trade Agreement and permanent normal trade relations with China since day one. The North American Free Trade Agreement led to the loss of 700,000 jobs. The trade deal with China led to the loss of 3.2 million jobs. And since 2001, nearly 60,000 manufacturing plants have been shut down and 4.7 million jobs have been lost. “Trade is a good thing. But trade has got to be fair. And the TPP is anything but fair,” Sanders said. In addition to shipping thousands of jobs overseas, the Trans-Pacific Partnership would increase already skyrocketing drug prices and threaten American laws that protect the environment, workers and consumers. “As your president, not only will I make sure that the TPP does not get implemented, I will not send any trade deal to Congress that will make it easier for corporations to outsource American jobs overseas,” Sanders said.